NEW VOICES: "Death Penalty Has Had Its Day in North Carolina"
Mark Edwards, chair of the Nash County (North Carolina) Republican Party, recently spoke about replacing the death penalty with a sentence of lfie without parole: "As a conservative seeking to find the best way to protect the residents of this great state from crime, I believe the death penalty has had its day in North Carolina. It is time to begin the debate on replacing the death penalty with life in prison without parole." He also said, "We are advocating that we replace the death penalty with life in prison without parole, which would will prevent debacles like the Oklahoma execution. It is a tough punishment, and inmates with no hope of release certainly do not live on 'easy street.'" Edwards is a member of North Carolina Conservatives Concerned About the Death Penalty, and he pointed to the toll executions take on correctional officers, especially when executions go wrong: "No matter how professionally the staff carries out its duties, a community is formed and relationships established with the prisoners, including those who sit and wait on death row. Then they have to participate in the inmate’s execution. That cannot be easy for these men and women," Edwards said. "It is not fair for us to impose these untested (and, as the events in Oklahoma remind us, possibly unreliable) drug protocols on the dedicated staff of the Department of Corrections." Read the full letter to the editor below. 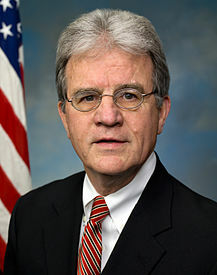 Republican Senator Tom Coburn of Oklahoma recently said he believes the April 29 execution of Clayton Lockett, “was certainly not done appropriately.” Coburn, who is also a physician, added, “It’s an unfortunate thing but, again, anytime you’re doing anything with the body, things can go wrong." He also spoke more broadly about his views on the death penalty, saying, "I don’t like it. I wish we put everybody that had such a history as this gentleman behind bars working and doing things that would help them." With regard to the investigation the state is conducting on the botched execution, Coburn said, “Oklahoma will correct it. They’ll be transparent about what happened. They’ll fix what happened." The senator did say he thought the death penalty had "deterrent capability." A recent survey by the Kinder Institute of Houston, Texas, found that more than two-thirds (69%) of area residents preferred alternative sentences over the death penalty, and that number is growing as the population becomes more diverse. The survey asked whether persons convicted of first-degree murder should receive a death sentence, life in prison without parole, or life with the possibility of parole after 25 years. Only 28% of respondents chose the death penalty. Life without parole was the most popular option, receiving 39% support, while life with the possibility of parole was second with 29%. Just four years ago, combined support for alternative sentences was only 54%. The Kinder report noted that in the past three decades the Houston area has been transformed "into the most ethnically and culturally diverse large metropolitan region in the nation." Whites now constitute a minority in every age demographic except those 65 and older. This growing diversity may be a factor in changing attitudes about the death penalty, as public opinion polls consistently show lower support for the death penalty among blacks and Latinos than among whites. In the past, Harris County (Houston) had produced more executions than any other U.S. county, but in recent years there has been a dramatic decline in death sentences. In a petition to the Ohio Parole Board, Cuyahoga County prosecutor Tim McGinty (pictured) requested the death sentence of Arthur Tyler be reduced to life in prison without parole. 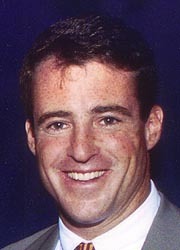 McGinty said, "At the time of Tyler's trial, Ohio law did not allow for the possibility of a sentence of life without parole for an aggravated murder conviction....In light of the limited sentencing options, the absence of the option of a sentence of life without the possibility of parole in this case may have led to the imposition of the death sentence." The petition also said that "evolving statements" from Tyler's co-defendant, Leroy Head, "are cause for concern" and "may undermine public confidence in Tyler's sentence." Tyler has consistently maintained his innocence, and is asking the Parole Board for a commutation to a sentence of life with the possibility of parole. Head was released from prison in 2008. On April 17, the New Hampshire Senate voted 12-12 on a bill to repeal the death penalty. The Senate then voted to table the bill, meaning it could be brought up for reconsideration later in the legislative session. New Hampshire has not had an execution since 1939 and has only 1 person on death row, whose status would not have been affected by the bill. The bill had overwhelmingly passed the House earlier, and Gov. Maggie Hassan indicated she would have signed the bill if it passed the Senate. Senator Bob Odell, one of two Republicans who voted in favor of repeal, had previously supported the death penalty, but said he could not explain an execution to his grandchildren. 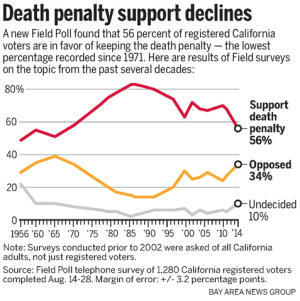 Some of those who voted to retain the death penalty were concerned that passage might reduce the sentence of the one man on death row, even though the bill stated it would apply only to future cases. In other states where inmates were left on death row after repeal, none have been removed because of the repeal legislation.